Click image above to see how our programs can benefit you. 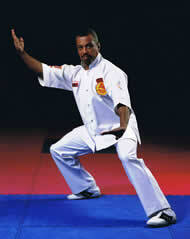 The Wu-Shu ideal is graceful yet explosive power is instantly available in a head-to-toe healthy body. Among our instructors are masters of classic tien shan pai fighting and champions with traditional Chinese weapons. We use 21st century smarts to keep every workout new again. And to this day, all the world admires a kung-fu studentï¿½s vibrant energy and special kind of poised self-confidence. 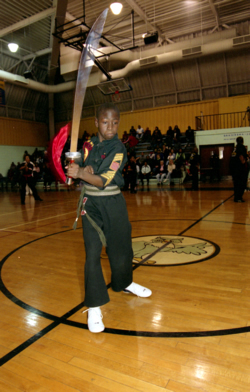 Below is our extensive list of Martial Arts classes and youth programs. Click on each name to learn more. All our youngest students, ages 4-6, want to be Dragon Tots. 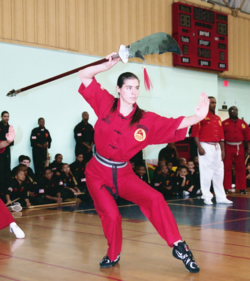 Dragon Drills focus on character-building as well as fitness, fun and self-defense. Children learn to enjoy paying attention, doing what they are asked to and being active. 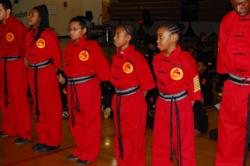 And Dragon Life Skills allow the instructor to explain about good manners, focus, self-respect and self-discipline, so that even the littlest students can turn these traditional kung-fu values into success and happiness in their daily lives. 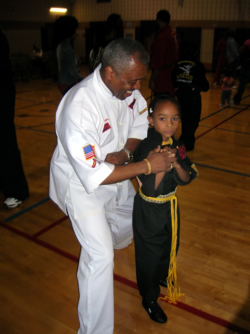 Youth, 7 to 12 year olds, begin their Quest to Be the Best by developing the Life Success Skills of a classic kung-fu student. These positive values include respect for self and others, concentration and the will to work hard to achieve worthwhile goals. Then, starting with learning how to take a strong stance, challenging and exciting classes teach perfect punching and on-balance kicking. By also working on stretching, better conditioning, physical coordination and timing, students learn high-speed action forms whose graceful power are the essence of traditional Chinese boxing. 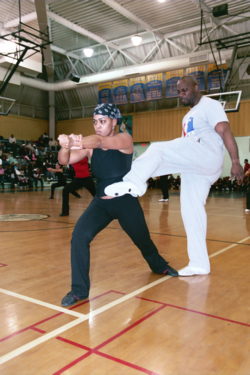 Adult Kung-Fu develops the flexibility and core strength needed to progress quickly from balanced stances to Chinese-style strikes with hands and feet and other body parts. 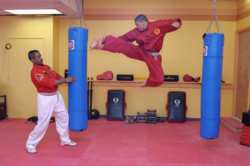 High-energy classes teach fast, fluid action forms that demonstrate in motion Wu-Shuï¿½s arsenal of extraordinary fighting techniques. History proves the best shape you can get in comes from practicing the dangerous beauty and split-second timing of great traditional kung-fu. Kung-Fu Weapons teaches the expert handling of unique old-school sharp-edged or impact Chinese weapons ï¿½ long, short, hard and lesser-known flexible multi-sectional weapons unlike anything ever seen in the West. The Chinese say: ï¿½You become your weapon.ï¿½ Fascinating in themselves, weapons training also develops an ability to adapt and use any handy object for emergency self-defense. 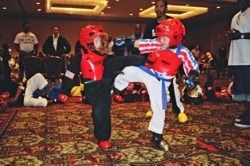 Sparring practices light-to-no-contact fighting in a safely-controlled setting. 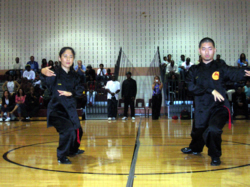 By sharpening their empty-hand skills, students acquire enough confidence in themselves and Wu-Shu self-defense techniques to win tournament prizes ï¿½ or to stand up to real-life encounters. Weapons Sparring allows students wearing state-of-the-art protective gear to experience how it feels to use padded weapons. The fast-paced action is always safe but almost as exciting as real combat. Chin-Na is the no-hitting art of pressure points, balance and joint manipulation used to counter and control an opponent without ever punching or kicking. Since special knowledge, not raw strength, is whatï¿½s important, this science of how to break-away and escape is also especially appropriate for women caught up in real-life street situations. 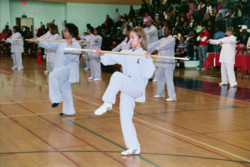 This continuation of the Tai Chi experience uses the light, deft manipulation of classic weapons, especially the sword and the staff, not so much to harm opponents as to express and perfect studentsï¿½ progress in controlling their chi energy. 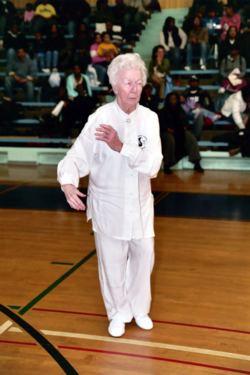 Called ï¿½Tui Shou,ï¿½ Push Hands is a one-on-one game whose no-impact fun also helps teach Tai Chiï¿½s close-in martial applications. One gentle Tai Chi push, correctly placed, can send the biggest football player helplessly staggering backward, arms wheeling, struggling for balance. So this class makes a good fighter a better fighter. Experience the Training Centersï¿½ famous high-energy exercise and conditioning class. 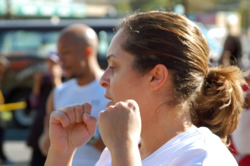 Martial arts done at a cardio pace is the worldï¿½s best and fastest total-body workout ï¿½ and the most fun. Gain strength, toning, flexibility and championship endurance; lose weight and the blues. Exhilarating! Donï¿½t know which class is best for you? Take QUICK START (adult, youth & Dragon Tots). Quick Start is a no-pressure opportunity for you to try out all the different programs we offer there, to meet our world-class instructors and experience first-hand the energy, fitness, self-confidence and sheer fun of SHAOLIN WU-SHU.